This genus is accepted, and its native range is Europe, NW. Africa. Annual. Culms erect, or geniculately ascending; 2-9.25-17 cm long. Ligule an eciliate membrane. Inflorescence composed of racemes; exserted (1), or embraced at base by subtending leaf (1). Racemes single; unilateral. Rhachis subterete. 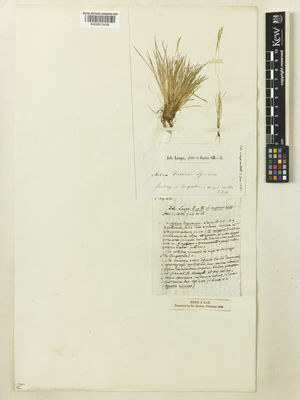 Spikelet packing broadside to rhachis; 2 -rowed. Spikelets appressed; solitary. Fertile spikelets sessile. Spikelets comprising 1 fertile florets; without rhachilla extension. 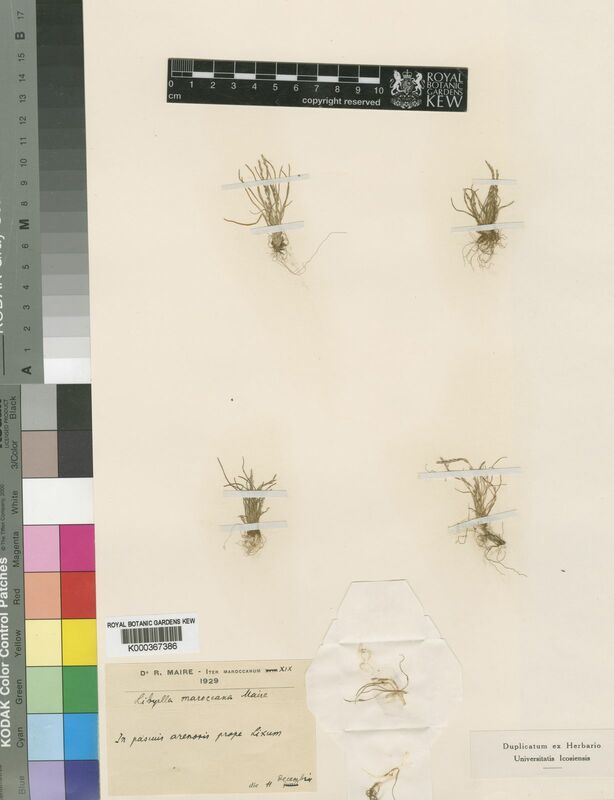 Spikelets oblong; laterally compressed; 1.8-2.722-3.6 mm long; breaking up at maturity; disarticulating below each fertile floret. Glumes persistent; exceeding apex of florets; similar to fertile lemma in texture (1), or firmer than fertile lemma (1). Lower glume oblong; 1 length of upper glume; membranous; without keels; 1 -veined. Lower glume lateral veins absent. Lower glume surface smooth (1), or asperulous (1). Lower glume apex truncate (1), or obtuse (1). Upper glume oblong; 1.5 length of adjacent fertile lemma; membranous; without keels; 1 -veined. Upper glume surface smooth (1), or asperulous (1). Upper glume apex truncate (1), or obtuse (1). Fertile lemma oblong (1), or ovate (1); hyaline (1), or membranous (1); without keel; 5 -veined. Lemma surface pubescent. Lemma apex erose; truncate. Palea 0.75-0.875-1 length of lemma; 2 -veined. Palea surface pubescent. Lodicules absent. Anthers 3. Stigmas pubescent. Caryopsis with adherent pericarp; ellipsoid; laterally compressed (1/1). Hilum punctiform (1), or elliptic (1); 0.3 length of caryopsis. Europe (1), or Africa, or Australasia (1). Leaves digitately 3-foliolate; stipules single at the nodes in Africa, elsewhere in pairs. Flowers small, few in leaf-opposed racemes; bracteoles absent. Calyx subequally lobed, the upper lobes largest and slightly curved. Standard not exceeding the calyx, yellow or cream-coloured, narrow; keel narrow, ± as long as the wings, bluntly pointed. Stamens all joined in a sheath open on the upper side; anthers all small, similar, rounded. Pod membranous, sessile, flattened, narrowly pointed-oblong to linear, with the stylar beak projecting forwards, dehiscent, many-seeded.